All my spirit exalts (Deutsches Magnificat). Composed by Georg Philipp Telemann (1681-1767). Edited by Klaus Hofmann. Arranged by Klaus Hofmann. For Soli SATB, SATB Choir, 2 Oboes, 2 Recorders f1, 2 Violins, Viola, Basso continuo. This edition: Paperbound. G-Dur (G major). Stuttgart Urtext Edition. 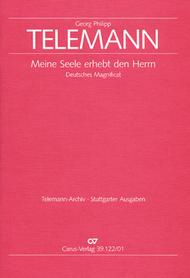 German title: Magnificat "Meine Seele erhebt". Magnificats, Christmas. Level 3. Full score. Language: German/English. TVWV 9:18. 72 pages. Duration 25 minutes. Published by Carus Verlag (CA.3912200).ISBN M-007-05567-7. With Language: German/English. Magnificats, Christmas.The German Magnificat by Georg Philipp Telemann appears with this edition for the first time in print. The text of the edition is that of the Berlin score in modern notational form.